A Blog by Nick Venedi ... Nick venedi: Was Mao misunderstood? I was having a debate at the usual pub somewhere in Clapham village with a few friends last night like you do when you had a hard week and you are glad that the weekend has arrived and Lord Young has resigned and moved back to legoland. One of them, who is as charming as Robert Mugabe and looks like Anne Widdecombe (on a good day) insisted that Mao was a piss artist and that he was simply self obsessed, in other words an unlikely leader who happened to be in the right place at the right time and slipped through the net, then another friend produced evidence based on what a member of the gang of 4.5 had said which would prove that Mao liked to have a drink or six. 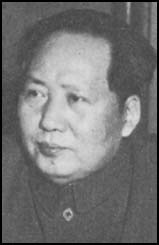 The ridiculous thing about the debate is that no one remembers any of the detail of what was said this morning it is however true that Mao's cultural revolution was a nasty attempt to control the minds of people who have a right to exercise their right to free thinking. He was a dictator and a nasty piece of work like all other dictators.